The Cutter & Buck VIP Cotton Weekender Duffel just made going away easier. Organize your belongings in the large zippered main compartment or in the zippered back inside pocket. 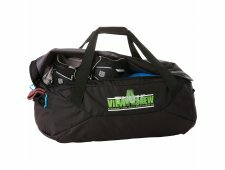 Carry this duffel with the adjustable, removable padded shoulder strap, by the tarpaulin grab handles with Cutter & Buck branded snap button closure or attach it to your luggage handle with the back trolley sleeve. This duffel offers luxury details like logo zippered hardware, cotton striped interior lining and a durable tarpaulin bottom. The perfect bag for organizing the roof box load. Easy access to your gear through oversized, wide-mouth opening. Quick access to smaller items through external slash pocket. Shoulder strap and padded grip handles for comfortable carrying. The Cutter & Buck Bainbridge Slim Duffel is perfect for short getaways. 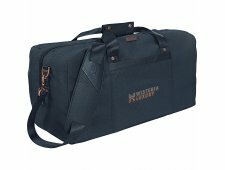 This duffel offers Cutter & Buck luxury details like rich heathered charcoal material, embossed leather accents, and a branded snap closure on the grab handles and webbing. You’ll have room for all your necessities with a large zippered main compartment, a front slash pocket and a zippered back pocket. With the adjustable, removable padded shoulder strap, you can just grab this duffel and go. 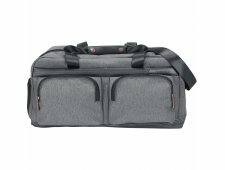 The Cutter & Buck 20" Bainbridge Executive Duffel is the perfect blend of luxury and functionality in a travel bag. 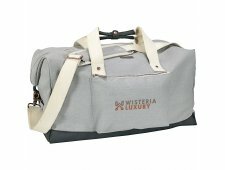 This duffel made from a high density nylon material, features Cutter & Buck signature hardware and leather accents, and can be used as a carry-on. Featuring two zippered front pockets, a zippered interior pocket, a magnetic closure back pocket and vented side shoe pocket, this well thought out bag has room for it all. Carry this bag with ease with the adjustable, removable padded shoulder strap or the custom leather grab handles.